I’m heading to Cleveland, Ohio, to give a workshop and a keynote talk at the Industry Product Conference. This will be my first time participating in this conference, and I’m really looking forward to it! In case you aren’t familiar with the Industry conference, I wanted to share why I’m excited to participate. I really like the format of the conference. The main conference is two days long (Thursday and Friday), so it’s going to be chock full of great PM advice. It’s a single-track conference, with each morning and afternoon focused on one of four topics: ideation, design, development, and growth. As if that wasn’t enough, there’s also an optional workshop day on Wednesday. There are three half-day workshops to choose from and they start at 1 pm, which gives you plenty of time to settle in after your travels. Industry limits the workshop size to 40 people to ensure they are highly engaging and interactive. There’s also plenty of time baked into the schedule to meet and compare notes with your fellow product people (aka “PM Therapy”). There’s an early registration party Wednesday night for workshop attendees and anyone else who’s in town the night before. After the conference on Thursday, there’s a happy hour at the conference venue followed by a party at the Hofbräuhaus. Party on, Wayne! Industry is a fast-growing product conference now in its third year. In my experience I’ve found that, just like most Microsoft products, it usually takes a conference until Version 3 to hit its stride. They expect over 600 attendees at this year’s conference. Industry earned a place on my list of the Top 10 Product Conferences of 2017 (which I published earlier this year). Many product conferences in the United States tend to be in the San Francisco Bay Area. So it’s nice to see a product conference in a new city: Cleveland, Ohio. I’m personally excited to head back to the Midwest because I studied at Northwestern University. I’ve heard great things about Cleveland and look forward to checking it out. The city has a rich musical history, including the Cleveland Public Auditorium where the conference will be held. It will be pretty cool to give a keynote speech from the same stage that the Beatles played on back in 1964. The Rolling Stones, Bob Dylan, Chuck Berry, Ray Charles, and many more talented musicians played there. 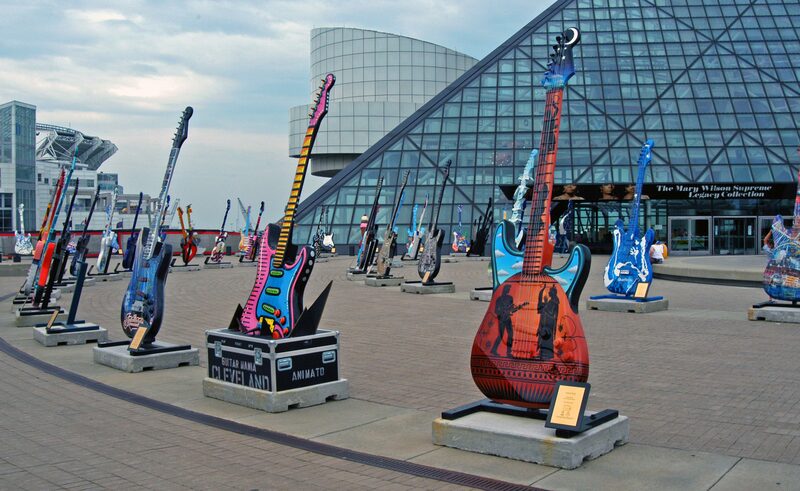 Cleveland is also home to the Rock and Roll Hall of Fame. Publish their Build Launch Scale podcast. I had the pleasure of being interviewed by Mike Belsito for their first episode. Last but not least, I am grateful to the organizing team. Believe it or not, Product Collective and Industry are run by a small but talented team of just three people: Mike Belsito, Paul McAvinchey, and Rebecca Feliciano. It takes a lot of hard work and dedication to organize a conference for 600 people. So be sure to give them a well-earned “thank you” if you run into them at Industry. If this all sounds amazing and you have some serious FOMO right now: don’t worry, there are still a few tickets left if you act fast. For those about to rock at Industry: we salute you! 🙂 Look forward to seeing you there!